Michael G. Starkey is a conservation biologist, ecological consultant and public speaker working to educate and involve the public in wildlife conservation issues. Michael has a diverse background in the field of wildlife conservation and he has worked as an ecological consultant for environmental consulting firms and government agencies such as the U.S. Fish & Wildlife Service and the California Department of Fish & Wildlife. He has worked with a wide diversity of wildlife, including San Francisco garter snakes, giant garter snakes, California tiger salamanders, bats, ringtails, and Yucatán black howler monkeys. Michael has developed and implemented community-based conservation initiatives, which focused on the protection of wildlife populations in Belize, Ghana, and India. Michael is a Co-Founder of Save The Snakes and serves as Executive Director. 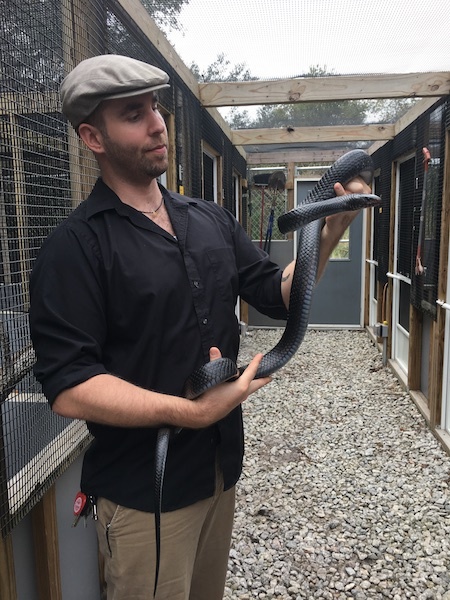 He uses his knowledge of snake ecology, positive attitude to inspire, and enthusiasm for snake conservation to engage the public with protecting these beautiful animals. Michael has given presentations around the world to inform the public about the threats facing wildlife and to help nurture a society that respects and appreciates nature and wildlife. Listen in on our interview we conducted via Skype to find out more about snakes, how to live peaceably with them and how to help Save the Snakes!